Boutique living signifies the touch of style and elegance afforded to our prestige guests and residents. 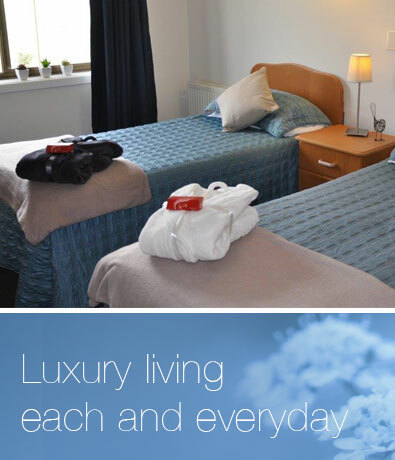 Whitehaven has enjoyed a reputation in Geelong as the pinnacle in supported living, offering outstanding care to our guests. Whitehaven is a true alternative to government funded facilities. Testament to the quality of service to which we our afford guests is that 95% of our business is return guests or by direct referral. Whitehaven will continually challenge industry standards in all aspects of care and service delivery allowing families’ confidence in our pursuit of excellence. Family owned and operated – we are in touch with our residents, understanding every individual has different needs and continuously reviewing ways in which we can improve the experience of our guests. Small boutique, privately owned facility offering the very best of community living in exclusive surroundings. Set in a tranquil garden setting. Whitehaven Offers private courtyards, expansive grassed area, raised garden beds for the garden enthusiast, and even chickens for those who yearn for a touch of country living!! Vast garden area with lawns large enough for that family game of cricket when the grandchildren visit!